With a war-cry of “Do it yourself!” a sizeable number of brides turn to the Internet to make their shopping and wedding inspiration decisions. 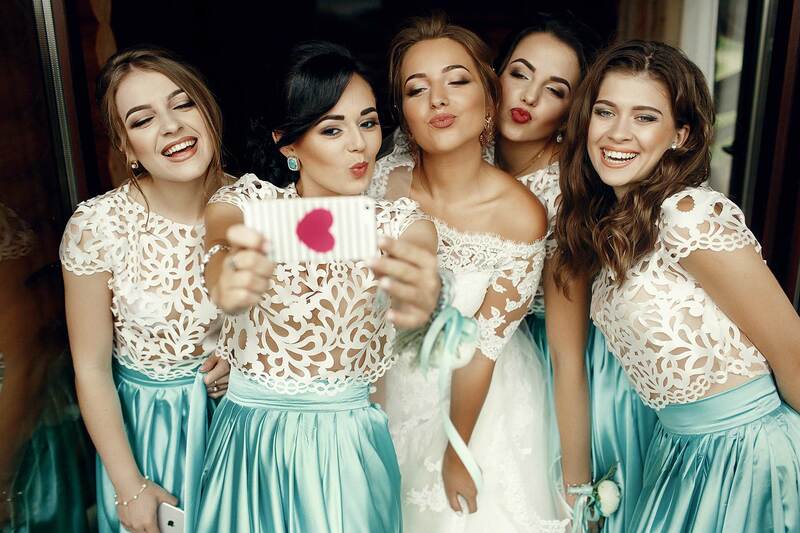 According to MarketResearch.com, “approximately 64 percent of brides use Pinterest to find inspiration, and many couples plan their weddings through apps and mobile devices.” With the rise of the sharing economy, more brides and bridesmaids are comfortable with DIY alternatives than paying for professional services. Here are some ways to get great and memorable photos on your big day without spending on a professional. What you lose in polish you just might make up for in spontaneity. “If you’re trying to cut costs, you can always ask a friend to take pictures”, says wedding planner Stacie Baines. Because smartphones already offer filters and editing software, pictures still come out beautiful. Many budget-savvy brides recruit a friend or two to cover the pictures on their iPhone and smartphones without spending a dime, said Baines. If you want physical copies of your pictures, you can always go to your local Target, Walmart or Walgreens to print. Or, if you want to print a bulkier look to hang in your home, you can always print your wedding pictures to beautiful wall canvases with Shutterfly. Geofilters are creative overlays that capture where you are or what you’re up to in a Snap. You can create your own, and surprise Snapchatters (and wedding attendees) in the locations you choose. When you create your own wedding geofilter, your guests can take selfies and snap pictures with your design. This is an easy way to spread the word of your big day all over Snapchat stories and shared social media outlets. Live is the best way to interact with viewers in real time. You can check out their Live Reactions to gauge how your broadcast is going too! For example, a member attending your wedding can Live stream your wedding day right to Facebook where anyone who couldn’t attend and friends in general can see it! They can leave real-time comments and if you ask them to- might be prompted to share your video. Facebook Live Tip: Build anticipation by letting your audience know when you’ll be going live with a written post. We’ve found one day’s notice gives people the right amount of time to tune in. If going social isn’t necessarily what you want to do on your big day, you can always hire a professional photographer and videographer. It’s totally up to you! If you’ve done what you can with negotiating wedding costs and you still find yourself with a gap between budget and price tag, check out how a LendingPoint personal loan can help with your plans. We’ll quickly tell you how much you qualify for, and you can choose the loan option that suits you best. Applying is simple and easy. Your loan could be deposited in your account in as little as one business day. Apply now and see!